Whether they're a kid or a kid-at-heart, this assortment of childhood favorites is certain to delight them. 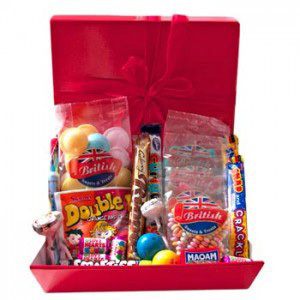 They'll have trouble knowing which one to tear into first when they find this gift box filled with famous British candies like Flying Saucers, delicious Strawberry Bonbons, fun Fizzy Cola Bottles, a Snap and Crackle Bar, and more. Send a taste of childhood on their birthday, to reward them for a good report card, or to remind a beloved child that you care.